One of my core beliefs is that if we give people access to the data, information, and tools they need to solve their own problems, they will. The Maker movement is an example of a group of people who embody this idea. They modify and improve the world around them. They look at a problem and not only say, “I am going to fix that,” but “my community is going to fix that.” The Maker movement is about a return to craft, but upgraded thanks to tools like 3-D printers. Imagine what would happen if MacGyver had access to a maker space or fab lab. Imagine what will happen as low-cost manufacturing tools allow people experiencing health-related problems to prototype and test solutions. I see a parallel between the e-patient movement and the Maker movement. I think what happened with the democratization of access to information and data is going to be mirrored in the democratization of design and manufacturing tools. We know that to untangle and improve our health care system we are going to need all the ingenuity and help we can get. Let’s do what we can to put tools into people’s hands. Let’s build people’s confidence about prototyping and testing ideas. Let’s see what people do when we give them access to their own data. 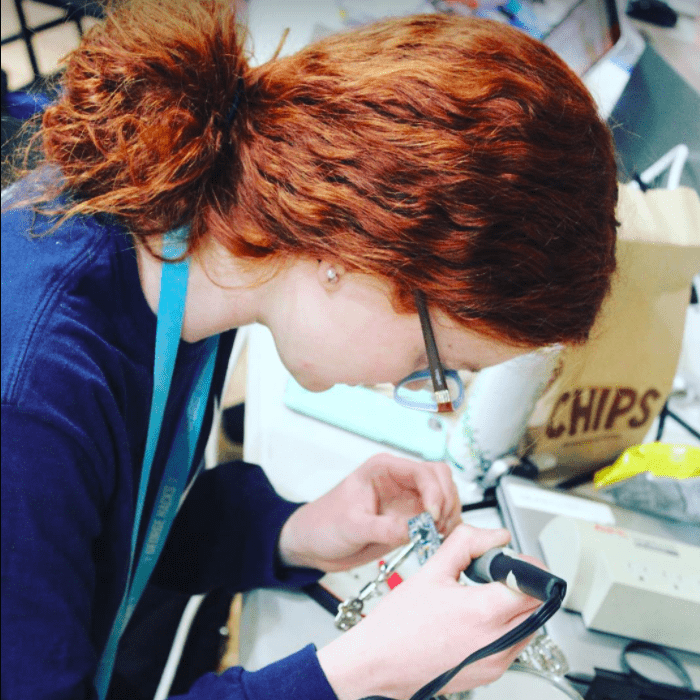 Featured image: Shea Metzgar working on her project for the inaugural George Hacks, a medical and assistive device hackathon held at George Washington University on March 24-25, 2018. Read about what the top four teams came up with in just 24 hours. Credit: Isabella Sardegna. Of course you know I’m aligned with this thinking. I’ll propose a tweak to the wording, though, based on numerous times people have argued with me about it! They say “I TRIED giving them access to the chart. They didn’t look. I TRIED prescribing a fitness tracker. They didn’t use it. Those things mostly end up on eBay.” So goeth the grouse. “Imagine if MacGyver? ?”, they ask? “My patients are nothing LIKE MacGyver. You live in a fantasy world.” So they give MacGyver nothing and say “See? ?” Not unlike the school athletic directors in the 1960s who saw no point in having girls’ sports, because obviously girls aren’t athletic, as anyone could plainly see. Perhaps give us our data and let us SEE what we can do with it. The ultimate disproof of that view in medicine is the OpenAPS movement, which didn’t even start with an objective in mind – they just looked at the data and the tools and cobbled something together iteratively … something that works better than anything the industry offers. And let’s (forcibly) not listen to the people who say there’s no point trying because nothing’s been done yet. Yes! Love this approach. And I love your connecting this to Title IX and OpenAPS.